Sometimes, you’ve got to tear down the old to make way for the new. That’s exactly what the Gruber Family decided to do with a dilapidated dairy barn on the property of their farm in Lewisville, Pennsylvania. Though the barn had been in agricultural operation for nearly 100 years, it was on the edge of collapse and no longer a safe working environment. Salvaging what they could from the original structure, they supplemented the hand-hewn beams from the original barn with felled logs from the farm, milled at nearby sawmills. Reconstruction of the barn began in 2011. The rebuilt space is now home to Old Stone Cider, which opened in late 2016. The cidery uses heirloom apples grown on the Gruber’s property, where they’ve lived and worked for the past 25 years. After sampling hard cider in Europe in 2010, the family decided to put their heirloom apple trees, the varieties of which are a hundred years old, to good use. Today, their company produces Old English cider offerings from the Roxbury Russett, Harrison and Stoke Red apples on the premises. In addition to sipping freshly poured ciders in the tasting room situated in the beautiful refurbished barn, visitors can take in the sights from the outdoor seating area and enjoy live music on various days throughout the week. Visiting food trucks provide culinary offerings to pair with Old Stone Cider beverages. 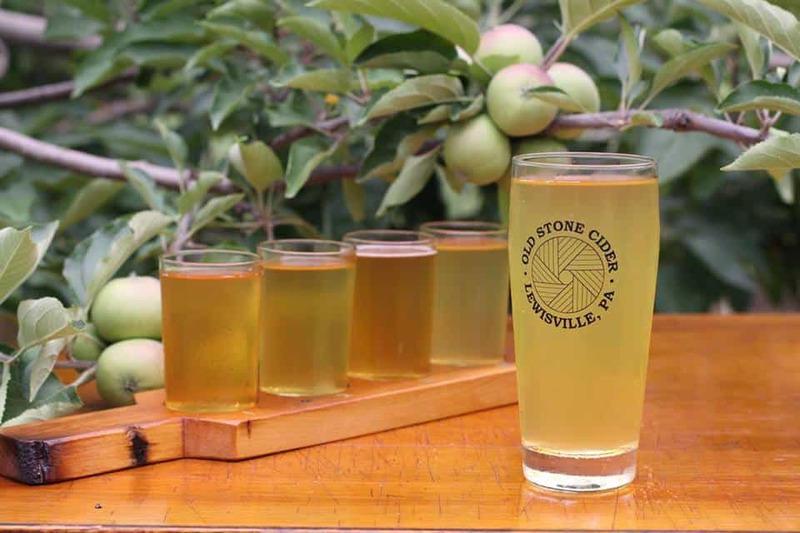 Learn more about this family-run cidery by visiting its Facebook page, or stop by Old Stone Cider to experience the refreshing ciders, food truck fare and exciting events unfolding throughout the year. Find Old Stone Cider at 959 Chesterville Rd. in Lewisville; phone: (484) 441-3344. Love this place. No other Cider mill like Old Stone Farm!